Stomach acid, also known as gastric acid, contains strong acids like hydrochloric acid, potassium chloride, and sodium chloride. Stomach acid on teeth is bad news. Since this acid will break down the contents of your stomach, it wants to do the same to your teeth. Contrary to how yucky it may feel, it’s not great to brush your teeth right after vomiting. It’s best to swish water around your mouth with a touch of baking soda after vomiting. 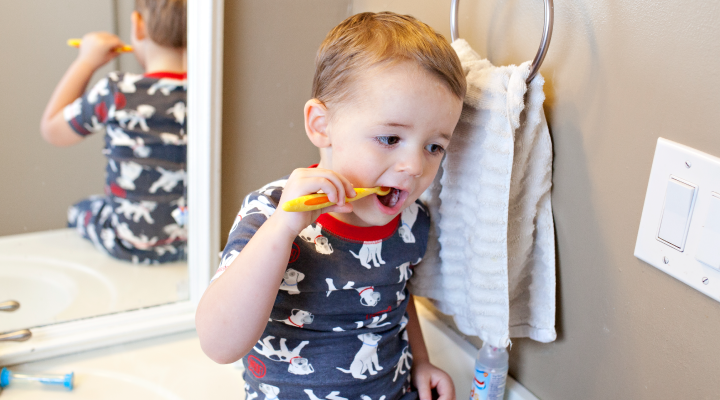 We recommend waiting at least 30 minutes before brushing. Brushing immediately after rubs the stomach acid on teeth. This expands the surface area that the acid touches, causing the acid to eat away at more enamel. Put a reminder in your phone so you don’t forget to brush 30 minutes later! Many of the popular cough drops on the market have added sugars to cut the taste of medicine. Sugar builds up on your teeth as you pop one cough drop after another. It might help to curb your cough, but it will wreak havoc on your teeth! If you examine popular “natural” cough drop ingredients, the first ingredient is sugar! Be sure to read the packaging thoroughly before committing to a cough drop regimen. It can be no better than sucking on a candy all day! Now you can properly care for both your illness and your teeth. We’re one step closer to discovering if brushing your teeth helps to fight illness! Without proper hygiene, bacteria in the mouth can reach dangerously high levels, leading to tooth decay and gum disease.